2016 Edmonds Community College Pow Wow participants. Photo courtesy of Edmonds Community College. Edmonds Community College’s Native American Student Association hosts its 33rd annual powwow, “Weaving the World We Want,” May 5-6. 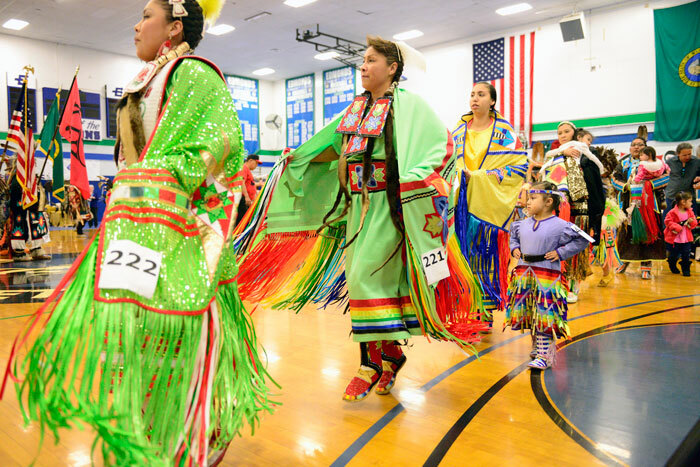 The powwow brings together students, families, and communities to celebrate American Indian singing, drumming, dancing, and arts and crafts. This event is free and open to the public. Dance and drum grand entries start at 1 pm and 7 pm, Saturday; and 1 pm, Sunday in Seaview Gymnasium, 20000 68th Ave. W, Lynnwood. This year, musician and educator Arlie Neskahi, of the Dine' (Navajo) Nation of New Mexico, is the master of ceremonies. He is well known for his performance, composition, and knowledge of traditional music. The college also welcomes Robert Charles, arena director; Scott Rehaume, head men’s dancer; Loni Long, head woman’s dancer; and Good Bear, host drum. Edmonds CC is committed to providing culturally enriching educational opportunities throughout the event through traditional storytellers, elder performances, and healthy and sustainable traditional food options. Powwows are social gatherings — open to all people — celebrating American Indian tribes’ traditions, styles of dance, songs, families, and friendships. Dancers and drummers come to the college’s powwow from tribes throughout the Northwest and United States. In addition to hosting the annual powwow, students and employees participate in a variety of environmental, service-learning, and cultural activities throughout the year that supports local tribes and tribal members. For more information, go to www.edcc.edu/powwow. For directions to campus, go to www.edcc.edu/campus. 2018 Edmonds Community College Pow Wow poster. Image courtesy of Edmonds Community College.